Decades of studies have not only shown acupuncture to be an elaborate placebo, they’ve also taught us a few other things. We’ve learned that patients report the same relief no matter where you place the needles, as opposed to placing them in proper acupuncture points. We’ve also learned that it doesn’t matter if you actually use needles or simply poke patients with toothpicks; they have the same experience. Inserting needles into specific places defines acupuncture. 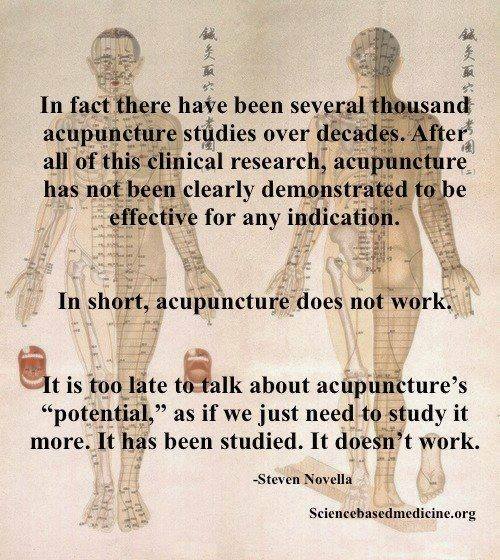 If we can get the same results without doing acpucnture, then acupuncture itself is quite inconsequential. In a nutshell this is why I think is useless nonsense in under 5 minutes. Acupuncture Is All Placebo and Here Is Why Brian E. McGeeney, MD, MPH via The SkeptVet | A Vet Takes a Skeptical & Science-Based Look at Veterinary Medicine who has himself/herself written a lot on acupuncture too.